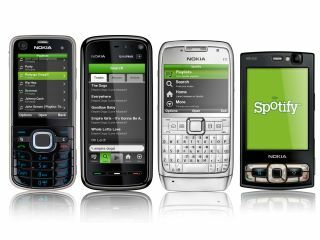 Spotify has announced that its mobile phone app is now available on the Symbian platform, offering up the music streaming service to a whole host of Nokia, Sony Ericsson and Samsung handsets. The service allows you unlimited music streaming on your mobile phone, as long as you have a premium account with Spotify, and that you are on a fixed data plan which allows you Wi-Fi or 2.5/3Ginternet access. There are 21 Nokia handsets compatible with the Spotify app. Interestingly, a number of these (including the 5320, 5530 and 5800 XpressMusic phones) already use the Comes With Music service – Nokia's own music-streaming app. Saying that, those with an N97 will be happy as the phone was left out of the Comes With Music Service, even though the handset is the company's flagship device. Other phones which can now access Spotify include the Sony Ericsson Satio and two Samsung devices: the GT-I7110 and i8910 Omnia HD. "Today we're delighted to announce the launch of Spotify for Symbian," says Spotify on its website. "Symbian is the operating system used by a number of smartphones including Nokia, Sony Ericsson and Samsung… We hope everyone enjoys this early Christmas present!" Currently Spotify is also available for the iPhone and devices on the Android platform. To access Spotify on your mobile, click on http://m.spotify.com/ through your phone. Or if you want to learn more about the service and see if you have a compatible handset, click here.